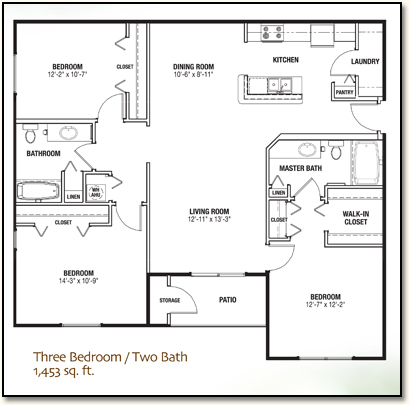 How would you like your apartment in Lady Lake, Florida to be larger than many single family homes in the area? This is completely possible at The Quarters, where our three bedroom floor plans offer spacious living, dining, bathroom, and storage areas. With 1,453 square feet, our 3 bedroom Lady Lake, FL apartments have nine-foot ceilings to give the effect of even more space and elegance. From the wide crown molding to the subtle shades of color throughout the apartment, our three bedroom apartment is practically a work of art. The Quarters apartments in Lady Lake is a community stocked with fabulous amenities, including a spacious clubhouse and pool, surround-sound theater, air-conditioned indoor full basketball court, and a business center equipped with a fax, copier, and computers. Visit or call our leasing office to hear more about amenities, floor plan options, and leasing specials. When you need a reasonably priced and beautiful three bedroom apartment in Lady Lake, Florida, The Quarters is your choice for style, service, and selection.